Day 01: Arrive in Kathmandu meet and transfer to Hotel. Day 02: Drive or fly to Pokhara, about 100 miles west of Kathmandu. This drive will take most of the morning, leaving much of the afternoon for a relaxing boat ride on Phewa Lake. Pokhara is Nepal’s second largest city. Many Tibetan immigrants have settled here and come to trade their goods in the markets and streets. It is also the major jumping off point for trekking in the Annapurna Himal, Dhaulagiri Himal, and Mustang. Day 03: Early morning flight. The flight starts with a climb up out of the Pokhara valley, cresting over the hill town of Ghorepani only a few hundred meters below into the Kali Gandaki valley. We slowly ascend as we cruise up the world’s deepest gorge with the Himalayan giants Nilgiri (7061m/23160ft) and Dhaulagiri (8167m) to either side. If the weather is clear the high peaks will appear almost close enough to reach out and touch. If the monsoon is early (spring trips) or hasn’t quite left yet (fall trips) then we may fly the low route, hugging the valley walls offering spectacular views of waterfalls, deep canyons, and terraced fields. The flight is a total of 20-25 minutes, culminating in a hair-raising but uneventful landing at the airstrip in Jomsom (2720m/8900ft). Jomsom is a relatively new town that is now home to the local government and an army base. Lunch here and clear our permits. After crossing the suspension bridge to the East Side of the Kali Gandaki we pass through the older section of Jomsom before following the trail into the riverbed. Eventually the trail joins the bank, undulating over small hills for the next 1 to 1.5 hours. The trail rises up a small hill before finally descending to the town of Eklobhatti, which is a new town of 3-4 hotels/lodges located directly on the river. Kagbeni 850m/9400ft) is now visible and takes another 30 min. to reach. This dusty town is relatively unchanged by trekkers, and sits at the border of the restricted Mustang region on the Tibetan Plateau. This is a short day, but good for altitude adjustment as Kagbeni is at almost 3,000 meters. There will be plenty of time to climb up into the barley fields above the town to get a glimpse into Mustang or perhaps of the snow-capped peaks of the Annapurna range. The newer part of Kagbeni is on the south side and will be our first view. 3 minutes into town we will cross a wooden bridge and enter the old part of Kagbeni, with its winding streets, Gompa, and town entrance gate. Legend says that one should think good thoughts when going through the gate, leaving all bad will outside the town. The Gompa has a new wing that was added on quite recently, however the older section is open for viewing if you can locate the keeper of the key (often not an easy task). This is well worth the visit as it has many fresco style wall paintings depicting the life and teachings of the Buddha and is quite similar to many of the older Gompas we will see further north in upper Mustang. Also note the architecture of the buildings; mud brick/adobe walls, flat roofs, and often-large piles of wood piled along the tops of the walls. These are characteristic features of the dryer regions in the rain shadow (i.e. North) of the Himalaya. 2.5 hours. Day 04: On the north side of Kagbeni (Photo) is the police checkpoint where we must check-in before entering the restricted region of Mustang. As we leave Kagbeni behind, we ascend a steep hill and are rewarded with views of our first prayer flags, stupas, and spectacular views of Kagbeni with a backdrop of the morning sun lighting up the Kali Gandaki valley and the sparkling white peaks of Nilgiri (7061m/23160ft), Tilicho (7134m/23400ft), and Khangsar Kang (7485m/24550ft) in the Annapurna range to the south. We descend back to river level and follow the river for about 45 min to 1 hour before ascending gently up to a large plateau that is an old river terrace (which now stands 100+ meters above the modern Kali Gandaki river level). These terraces are quite common throughout lower Mustang, often weathering into beautiful spires and mounts. After 30-45 min of walking across this relatively barren windblown plain, we descend steeply into the Ghidiya Khola canyon only to climb up the other side to the town of Tangbe. Tangbe is typical of lower Mustang villages, with adobe houses often built touching/onto each other and surrounded by beautifully terraced fields of buckwheat, barley, corn, and wheat. 4.1 miles, 2 – 2.5 hours. The trail descends gradually out of Tangbe to near river level. The rest of the walk is relatively mild into Chusang. Chusang is actually two halves separated by Narsing Khola coming out of the mountains to the east. About 45min walk up Narsing is the town of Tetang (photo 1, 2) that is visible as a walled town on a hill of terraces. Chusang is a truly beautiful place set deep in the Kali Gandaki canyon with red, orange and silver/gray cliffs all around. Notice the now inaccessible cliff dwellings in the large red rock face opposite Chusang. These are also quite common throughout Mustang. They were carved out and lived in by Buddhist hermits, often much or most of their lives were spent in meditation and prayer in these cliff side dwellings. 1 hour. Day 05:The trail heads out of Chusang along the Kali Gandaki river but quickly divides to either down in the riverbed (low water route) or hugs the east bank (high water route). We will usually take the lower route off across the now very wide Kali Gandaki riverbed (this is a fabulous chance to look for "saligrams", ammonite fossils considered holy by locals). Chele is visible in the distance atop a large nose, which protrudes into the Kali Gandaki river leaving only a narrow canyon through which the river flows. After 30 min walking the riverbed, the trails turns west up against a 4-story block of conglomerate which has fallen off the canyon walls and lodged itself in the riverbed. Cross the bridge over the Kali Gandaki and almost immediately ascend steeply to the town of Chele. 2 miles, 1 – 1.5 hours. From Chele we immediately begin a long ascent. The trail continues westward parallel to Chele Khola. After 45 min. we enter the Chele Canyon. This is a highly used section of trail and we will undoubtedly pass numerous donkey trains as we navigate the trail which winds upward hugging the north wall of the canyon and in places is literally carved into the cliff-side. As we continue upward, the village of Ghyakar comes into view across the canyon. Ghyakar is a small village with numerous terraced fields that spread down the canyon; abruptly stopping at the edge of a large cliff-face which drops off into the canyon. We will be heading directly towards a broad black peak (6059m/19870ft) (unless there has been a recent snowstorm in which case it will be white) which looms over us, as the trail becomes gentler. We approach the end of our climb and our first mountain pass at 3320m/10,881ft. Samar is another 20 min further along a gently descending wide trail. Samar (photo) is a small village set in a grove of poplar trees. The village has a commanding view of the valley below it. 3 hours. As we leave Samar we will pass by a few stupas which mark the north side of the town and then steeply descend into a small canyon before climbing back up the other side. Shortly thereafter we will cross another canyon before reaching the very umerous prayer flags. Buddhist believe that spiritual merit is attained by carrying stones up to passes where they leave the stones behind. Centuries of this practice have left significant piles of stones marking the passes of Mustang. If you are feeling strong we welcome you to carry up your own stone, and remember, the heavier the more merit gained. From the pass we descend and ascend again before arriving in the very small 1 house town of Yemdo (3800m/12460ft). We continue from Yemdo gently down and then to Yemdo La (3800m/12460ft) where we are rewarded with another even better view over all of Mustang. We descend down a relatively steep trail to Syangmochen (3600m/11800ft) with its two-three houses. The section of trail between Samar and Syangmochen is surprisingly wet and forested. Juniper trees (woefully missing most of their branches, which have been removed for firewood), dot the lower slopes while the higher slopes are virtually fully forested as they are inaccessible to local wood-cutters. We will pass through numerous small canyons that are home to an amazingly diverse number of plant species, usually found much farther to the south. Look for the Himalayan pine, fir, and small elm bushes (hackberry), and numerous types of roses. If we have time we can take a short but rigorous side trail just before Syangmochen to visit Rangbyung, a cave with numerous Buddha statues. 2.5 hours. The trail continues up a short, steep climb before leveling out and eventually rounding a large bend to Syangmochen La pass. From the pass it is a 15 min walk down a gentle wide trail to a split in the trail: the left fork drops in/out of two small canyons but stays high and eventually ends up in the town of Tamagaon (3450m/11310ft) and on to Nya La pass (3840m/12,600ft) while the right fork crosses two canyons and continue gradually down to the large town of Giling (3510m/11510ft). Giling is the largest village before entering Upper Mustang. The terraced fields (many now in disuse) extend from the town of Tamagaon more than half a kilometer up to the west to nearly 1 kilometer down to the east. Giling is home to three Gompas and numerous large stupas that mark the center of town and the old route to Upper Mustang. The newer route (the left fork) circumvents Giling, leaving this town a rarely visited gem. To the north of the town on a small hill are the ruins of a large nunnery complex and Gompa that fell into disuse when China occupied Tibet. The Giling area was a central location for the guerilla armies of the Tibetan (Khampa) resistance which eventually led to the closure of the nunnery and its subsequent dilapidation. On the north side of town are the active Monastery and Gompa, as well as the remains of one of the oldest Gompas in Mustang. Although its age is unknown, this Gompa houses some very old Tibetan artifacts as well as numerous oddities. These include a 500+ year old prayer book, a 1000+-year-old suite of armor from an ancient king of Tibet, numerous weapons from the Khampa resistance, and the centuries old mummified hand of a local thief who stole from the Gompa. The town is set among numerous small poplar groves along the stream running through its center and hosts a large common field where one can watch grain being threshed, animals grazing, and children playing. 1 hour. Day 07: We exit Giling to the west along the base of the cliffs to the north on a gently climbing trail. After 20 min there is a rest area with numerous small stupas and an awesome view southward of the ruins of the Giling nunnery with a backdrop of the snowy steep faces Nilgiri and Tilicho towering above. From here it is another 20 min to where we turn north and start a steep ascent to Nya La pass (3840m/12,600ft). This pass marks the official entrance into Upper Mustang. From here are spectacular views of the Annapurna and Dhaulagiri ranges to the south as well as the impressive Tibetan plateau to the north. We continue with a gradual descent for nearly 3 miles which brings us finally to Ghemi La and a final short, steep descent into the town of Ghemi (3690, 12100ft). Ghemi is the first town under the rule of the King of Mustang. As with all of the significant towns in Upper Mustang, there is a royal house from where a relative of the King watches over the town. We will eat lunch/camp in the royal house and meet with the King’s brother. We can also tour the local Gompa if we have time. 2.5 hours. From Ghemi we cross Ghemi Khola and head up the slope on the other side. As we ascend this hill we will have a fabulous view back across the khola to Ghemi, with its terraced fields spread out to above and below the town. 20min. uphill before we cross the ridgeline and begin a 1 hour traverse across the slopes to the khola and finally to the first houses of lower Dakmar. Dakmar is a split town, with 4-5 houses set in a stand of poplar trees in the lower village and 8-10 houses in the upper village about 20 min further along the trail. The Dakmar (photo) area is beautiful with large tracts of terraced fields that have been recently abandoned. On the alluvial fan (the fan shaped deposits left where a stream exits a mountain range) behind Dakmar, set among the now abandoned fields, are the ruins of the old city of Dakmar standing sentinel over the new town. 2-3 generations ago the village was moved to its present locations due to intense flooding as the local stream changed course, running through the main trail in the old town. The modern towns of Dakmar are set up against blood red cliffs with numerous ancient cave dwellings. These once housed monks who wished to devote their lives to prayer. The last monk to use these caves died not too long ago, and we will see numerous prayer flags indicating the holiness of these cliffs. 1.25 hours. Day 08: We will leave Dakmar to the west, walking along the base of the cliffs. After crossing a small khola we head north and start ascending, eventually reaching the top of the cliffs after 1 hour. We are quit high now, roughly 4000m/13100ft! From here we continue to head north over rolling hills along the edge of the 20,000+ft mountains to the west, arriving at Lo Ghekar after about 1 more hour. Lo Ghekar is a small town at 884m /12740ft with lovely grassy meadows usually inhabited by local yaks. It is also home to the oldest Gompa in Nepal, Ghar Gompa (built between 775 and 787 AD), which is a relatively small building with prayer wheels along one side. Lo Ghekar is rumored to be the site of a great battle between Padmasambhava (the founder of Tibetan Buddhism) and the forces out to destroy Buddhism. Local legend says that after he defeated these evil forces he headed north to establish the first monastery in Tibet (Samye Monastery). The trail continues out of Lo Ghekar to the north with a short descent to a wooden bridge across a small khola and then a steep ascent up the other side. The entire Mustang valley is visible from here and we will be rewarded with numerous fabulous views cross Mustang as the day progresses. After 2 hours we begin our last long uphill before Lo Manthang. The trail follows a small khola uphill for about 1-1.5 hours to a broad pass at 4200m/13780ft. This is the highest point on our trek! From here the trail winds its way slowly down to a pass at 4095m/13440ft where we get our first views of Lo Manthang far off across the ‘Plain of Aspiration" below us. The trail descends moderately steeply to the base of the hills and then sets out across the plain towards Lo Manthang. It will take another 1 or so to reach the city. We will camp not far from the main entrance gate outside the walls of the city. 6 hrs. Day 09: Lo Manthang-This is the capital city of the kingdom of Mustang. The town sits in a broad valley filled with fields, horses, and yaks. We have timed this trip to coincide with the annual Tiji Festival here in the capital city. This is said to be one of the last great traditional festivals in the Himalaya and will be quite an experience, including contests of horsemanship like horse racing across the ‘Plain of Aspirations’ outside the walls of the city, interpretive mask dances telling the stories of Tibetan Buddhism, and even a huge tug-of-war contest. Very few tourists have ever witnessed this festival and we are the only company that has arranged for a local monk to accompany our group throughout the festival to explain these ancient traditions. In between festival activities we will explore this fascinating town. Just inside the city gate is the imposing 4 story tall palace of the King. He and the queen will undoubtedly be attending many of the festival events and we will be sure to request an audience with him. The town also has four of the largest and oldest Gompas in Nepal, dating back to the 14-15th centuries. These are spectacular structures featuring traditional Buddhist paintings, woodcarvings, and massive Buddha sculptures. The local monastery/school serves as one of the only centers of education in Mustang. This is a very well run institution that is striving to preserve the traditional teachings of this small kingdom. The city is tremendously friendly with intimate narrow alleys and courtyards. Day 10: Lo Manthang valley- we will continue to attend the festival and possibly go on horseback to some of the monasteries north of the city. Day 11: To Dhi, The trail to Dhi heads south out of town towards the hills west of the Mustang Khola. After about 30 min of walking across the plains south of the city, we begin moderately climbing, paralleling a small stream. After another 1 hour we ascend steeply out of the stream valley and begin following the ridgeline continuing south. Another 1of walking and we arrive at Dhi Pass (3700m, 12170ft). The view from here over the East Side of Mustang is spectacular. The town of Dhi (3450m, 11315ft) is directly below us at. The base of the near cliff to the east. The trail winds steeply down to Dhi from the pass and should be taken slowly. Views of Dhi far below are possible after 45 min. After 1.5 hours we arrive in Dhi. Dhi is a small town sandwiched between and large gray, orange, and red cliff and the Mustang Khola. This is a very rarely visited town. Be sure to walk to the hill south of town and checkout the ruins of an old monastery. The local monk here is known as the kingdom expert in bone injuries and should be in town if he hasn’t been called away to treat someone. 5.5 hours. Day 12: To Yara and Lori Gompa – We will leave our gear in Dhi and take a long day hike to the cave Gompa of Lori. The trail crosses the Mustang Khola on a makeshift bridge consisting of a log or two spanning the river. Follow the smaller stream across from Dhi for 45 min past incredibly sculpted cliffs and cliff dwellings (photo). The trail to Yara (3750m, 12300ft) leaves the stream and heads steeply uphill to the north for 45 minutes. We will visit Yara on the return trip if we have time. For now, continue following the stream for another 2 hours to the lower Gompa at Lori. The older Lori Gompa is in the large cliffs to the North. This is a spectacular area as the stream we have been following disappears into a deep canyon and the snow capped mountains rise before us. Ripumso Peak (5730m, 18800ft) looms overhead as we ascend for another 20 min to Lori Gompa. The Gompa itself sits 100+meters up from the base of the cliffs, nestled among a number of large spires. If the local monk is around we can make the hair-raising journey up the trail through the spires and on makeshift bridges to the Gompa. Inside are some of the most fascinating artworks anywhere in Nepal. The artistic style is a mix of very early Tibetan Buddhist iconology and Indian Buddhist style. The rooms of the Gompa are literally carved into the rock and are an amazingly well finished inside with smooth frescoed (i.e. Plastered and painted while wet) walls, unlike those seen anywhere else in Mustang, still remaining throughout much of the Gompa. Return to Dhi 7 hrs. Day 13: To Ghemi – To get to Ghemi, we have to go back up the trail above Dhi to Dhi Pass. From here we head south again, rounding the end of the ridgeline, finally descending to a streambed just above Tsarang. From here we will rejoin the main trail between Ghemi and Lo Manthang. Tsarang (photo 1, 2, 3) is the second largest town in Mustang. The Gompa will be very evident on a hill northeast of the town. The 3-story building just down from the Gompa is the royal palace here in Tsarang. It houses the Mustang library and numerous historic artifacts, but it is no longer used as a palace. This palace served as a winter home for the royal family in generations past. In many ways, Tsarang is a second capital of Mustang and has a very well kept and active monastery. It is a large town (for Mustang) and is well worth a stroll through its streets and a visit to the Gompa. We will continue our journey southward by exiting Tsarang along the long ‘lane’ which ends at the massive gate of Tsarang. One is able to easily walk through the gate and look op at the paintings lining the inside of the building. As we depart from the gate, look back at one of the more beautiful scenes on the trip. The Tsarang gate and prayer flags are set against a sweeping backdrop of all of Tsarang with her massive monastery and palace and finally the massive hills of northern Mustang rising gigantic behind. We will ascend shallowly for 1.5 hours through expansive scenery of snow-capped peaks to the west and east, finally arriving at Tsarang La (pass at 3920m, 12850ft). From here it is another 1 hour descent to the longest mani stone (stones carved with Tibetan prayers) wall in Nepal. From here we can see the town of Ghemi which we passed through many days before. After the Mani wall, cross the Ghemi Khola on the suspension bridge and ascend the slope to Ghemi ((3690, 12100ft). 6 hours. Day 14: To Samar – Today we backtrack along the same route we took heading north to Lo Manthang, but we will camp in the quaint town of Samar. 6.5 hours. 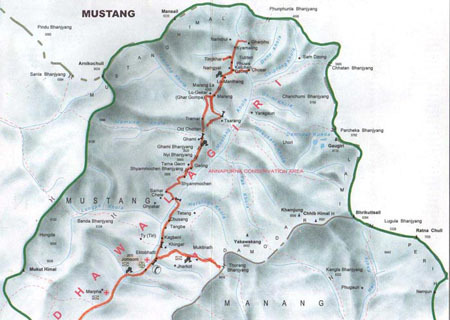 Day 15: To Kagbeni – Again retrace our steps to Kagbeni, where we will leave the restricted area of Mustang. 6 hours. Day 16: To Jomsom – A short walk to Jomsom on this day. Time to relax and enjoy the spectacular views of the Annapurna and Dhaulagiri Massifs. 1.5 hours. Day 17: To Kathmandu. 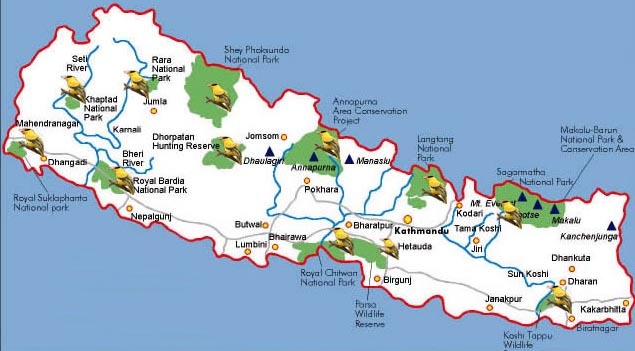 – We will take an early morning flight from Jomsom to Pokhara and then onward to Kathmandu, arriving in the evening. This will be your first night back in civilization, time to eat a great meal, take a much-needed shower, and enjoy the bustle of the city streets.